How did Blood Pudding Press start? It started in October 2006, in part because I was familiar with and appreciative of a few other small independent poetry presses and had realized that it’s mostly poets who publish other poets, so why not create my own itty bitty indie press that publishes its own unique hand-designed poetry chapbooks? I was nervous at first about somehow screwing up the formatting, design, presentation, or promotion, so the first chapbook I published was my own, The Laura Poems, based on Laura Palmer of Twin Peaks. Over the years, I’ve published individual poetry chapbooks, collaborative chapbooks, and chapbooks by multiple writers that are kind of like a hand-designed print lit mag with one extra-special issue. Earlier on, I mostly solicited the individual chapbooks, but in more recent years, I ran an annual poetry chapbook contest near the end of the year, in order to discover and choose which chapbooks to publish the next year. Tell us a bit about Blood Pudding Press. What are your influences, your aesthetic, your mission? The name Blood Pudding Press derived from me not being a fan of a certain style of light-hearted, comedic, semi-clichéd poetry, which seemed akin to vanilla snack pack pudding to me. I prefer more bloody, visceral, emotional, challenging, unique, quirky, non-mainstream, abstract artsy poetry, even if such styles are inedible to some. With that said, I’m open to a variety of different poetic styles (including styles that are very different from my own poetry), as long as they’re not light-hearted or comedic in a clichéd sort of way, or bland, or dry. My influences are poetry, creative communication, and artistic expression. My mission is to create and share some of that. 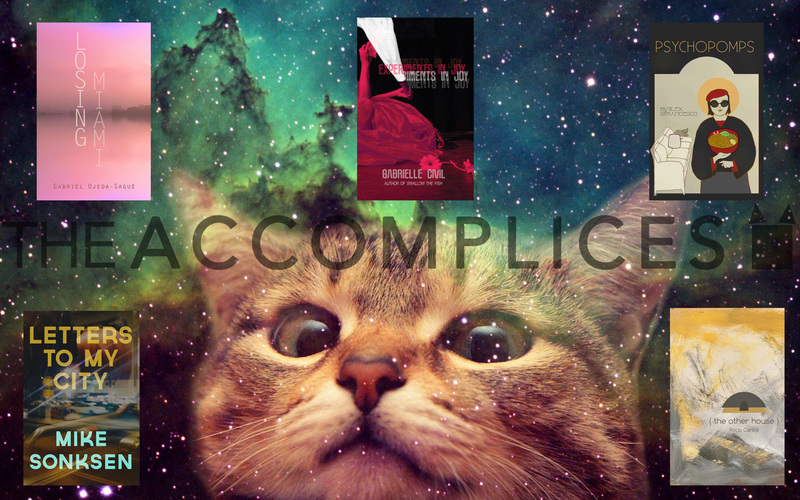 The three most recent publications were Blood Pudding Press’s three contest winning poetry chapbooks of 2015. 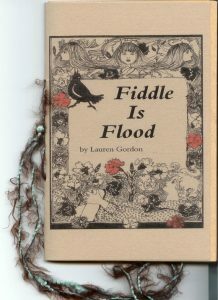 • Fiddle Is Flood by Lauran Gordon (a unique contemporary non whitewashed interpretation of Little House on the Prairie). Available here. 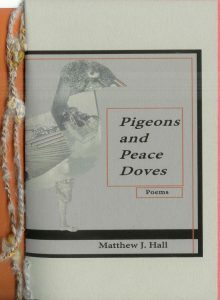 • Pigeons and Peace Doves by Matthew J. Hall (an individual portrait regarding how depression affects personal life and love). Available here. 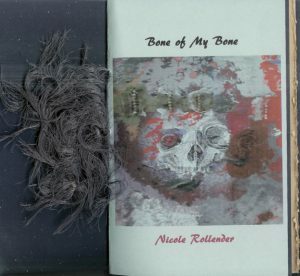 • Bone of My Bone by Nicole Rollender (a haunting exploration of heaven and torture and the bodies of saints and what might happen if you lose a life before it even comes out of you). Available here. One never exactly knows what the creative future might hold and Blood Pudding is currently nearing the end of a hiatus in 2016, during which I was hoping to restructure my poetic agenda, but I still haven’t quite figured out yet what I might want to do next. Hopefully, I’ll figure it out soon. It will definitely involve poetry in one way or another. I like small poetry-focused presses of many different shapes and sizes and textures and creative structures and approaches and how there are so many unique entities in poetry land. Especially in non-mainstream, independent poetry land. There’s so many to investigate and choose from, to find the ones that you feel you align with. One thing I wish would change is some small poetry people and groups being prone to quickly lash out and attack other small poetry people and groups that they don’t align with or that they disagree with. I’m not saying we shouldn’t feel free to express our point of view/thoughts/feelings/opinions, including on things we disagree about. But in more recent years, it seems to me that social media has caused this sort of expression to become more prone to fast group attacks that feel akin to taking sides. The attacks are even worse when they seem like an attention-getting sort of popularity contest in poetry land. I prefer a focus on promoting the presses we do like more than attacking the presses we don’t. How do you cope? There’s been a lot of conversation lately about charging reading fees, printing costs, rising book costs, who should pay for what, etc. Do you have any opinions on this, and would you be willing to share any insights about the numbers at Blood Pudding Press? Blood Pudding Press has never had an aim of making much money, but I will honestly admit, there have been times when my press is selling so few chapbooks that I find myself wondering if I’m somehow doing something wrong and if I can reasonably afford to keep doing it. Most of the chapbooks I’ve published have gotten a lot of promotion from me and the writer—a strong, positive buzz from others—and good reviews from various sources. If that kind of publicity doesn’t generate sales, then what does? Not that I’m looking for an expert answer, because I tend to dislike it when people act like they’re know-it-all experts on ANYTHING, even if they have experience. Feel free to share your own personal thoughts, feelings, and experiences, but don’t act like some know-it-all sort of king or queen. I think every press has their own way of doing things, I don’t have a right versus wrong mentality, I try my best to promote the writers I choose to publish. Low sales sometimes bother me a bit when the sales of a chapbook don’t cover the costs of creating that chapbook and when I feel the writer is not receiving anywhere near the attention their poetry deserves. However, there have been times during which the sales of a particular chapbook will significantly exceed the production costs, so overall it evens out fine enough for me. Ideally, I’d make enough money to be able to pay the writers too, but currently (and in the foreseeable future), I publish them, promote them, and offer them free and discounted copies of their books. Regarding what I charge to purchase a Blood Pudding Press poetry chapbook, the basic amount is $7.00 plus shipping. Regarding reading fees, for the last few Blood Pudding Press contests, I’ve charged a $5.00 reading fee, due to all the time I spend reading (Blood Pudding Press is a one woman gig; I’m the only one who reads all the submissions and I’m a slow reader), plus to substantially contribute to the cost of creating the three winning chapbooks. In the last few years, the number of chapbook submissions I’ve received has been a little over 50 submissions per year, so the more than $200 but less than $300 in reading fees I receive makes it more do-able and worthwhile for me to create three new chapbooks, send free author copies and review copies, spend a substantial amount of time and energy promoting those chapbooks and so forth. Similarly, I’m usually willing to pay a $5 reading fee to submit one of my own chapbooks to another small press—and occasionally, a $10 or $15 reading fee if I have the money at the time and if I’ve investigated the press and don’t feel they’re substantially overcharging for what they’re doing. I do realize though that some writers can’t reasonably afford ANY reading fee—and I respect, appreciate, and admire small presses that are willing to charge no reading fee or have the type of submission set-up where you can choose to submit for free OR pay a small fee. For me personally, I also hope that my $5 contest reading fee will encourage writers to investigate my press a bit and try to decide if it seems like a good fit for their style, rather than just sending their manuscript to every single press they see that doesn’t charge a reading fee. Regarding reading fees on a larger scale, I find it ironic, troubling, and bothersome that most of the presses that charge the highest reading fees seem to be academic presses and/or more well-known, large scale presses, because WHY? First of all, the higher a reading fee gets, the more people it excludes from submitting their manuscript, even if they want to. Second of all, in recent years, it seems that the reading fee for those book contests has escalated from an average of $15-20 to an average of $23-29. Maybe my mind is exaggerating that, but that’s the way it seems to me. So let’s say a more large scale press is running a book contest, charges a reading fee of $25 per entry and receives 300 submitted manuscripts. Well what in the heck are they doing with that $7500? Even if the winning manuscript’s writer received $1000 and 50 free copies of their book, that would still be close to $6000 for the press and I just don’t understand how a large press would need that much money to create and promote a poetry book. But I’m not a large scale or big name or academic press, so maybe I’m missing something. But obviously the poets without much money can’t afford to submit there. On the other hand though, even though I don’t understand or personally support or approve of high reading fees, I also know there are plenty of presses that charge small or no reading fees, so you can research the presses that resonate for you on various levels and share your creative work with those presses.